We are greatly honoured to be able to show the copyright drawings of Hall of Fame members prepared by Mrs I. Coucill on this web site. The exquisite portraits representing the Members of Canada's Aviation Hall of Fame are made by Toronto artist Irma Sophia Coucill. Mrs. Coucill's work is showcased in some of Canada's most distinguished museums – The Hockey Hall of Fame and the Canadian Business Hall of Fame in Toronto, Ontario, Canada's Aviation Hall of Fame in Wetaskiwin, Alberta, the Canadian Medical Hall of Fame in London, Ontario and the Canadian Indian Hall of Fame in Brantford, Ontario. Mrs. Coucill was born in London, Ontario and raised in Toronto. She has been involved with many publications including Fathers of Confederation, The Governors-General Since 1867 and The Prime Ministers since 1867. Mrs. Coucill has done editorial artwork for The Globe and Mail, The Toronto Star, Maclean's and Canadian Forum. In 1990 she was a contributing artist to the Junior Encyclopaedia of Canada and, in 1995, the Junior Encyclopaedia of Canada CD-ROM. Her latest publishing venture is a book on the 51 British prime ministers, from Sir Robert Walpole to Tony Blair. 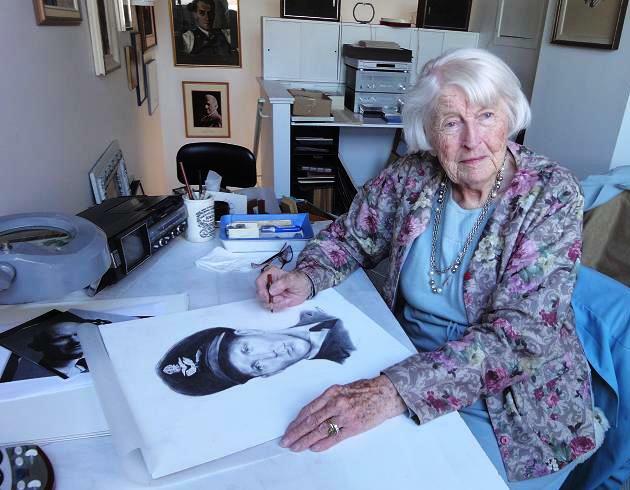 We were saddened to learn that Irma Coucill passed away on November 29th, 2015 at age 97.